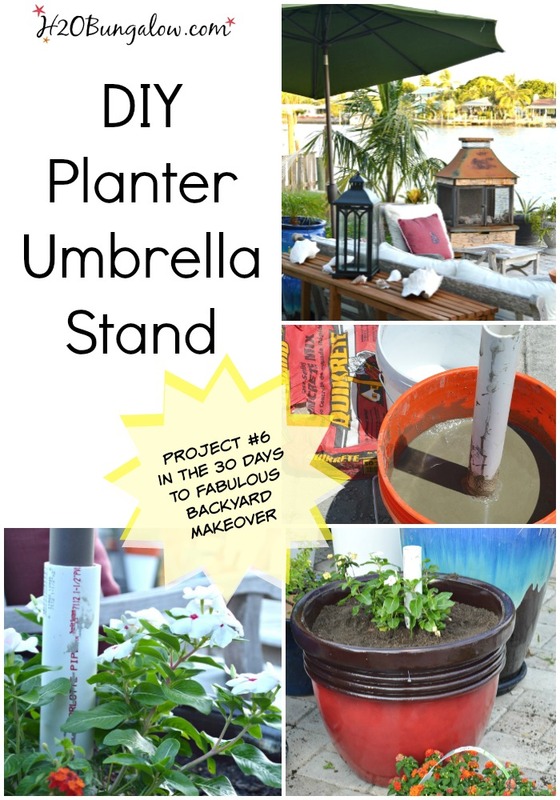 Today’s project for the 30 Days To Fabulous Backyard Makeover is an extra strong DIY planter umbrella stand tutorial. Imagine sitting and relaxing in the cool shade of an large patio umbrella. Enjoying the day, your friends have stopped by, conversation is good. Maybe you even have a nice glass of wine in your hand. All of the sudden, out of no where, whoosh, a big gusty wind blows in and next thing you know your huge and heavy umbrella has toppled over, barely missing your guests. Someone jumps up to run after it, dodging around so the pole doesn’t slam into them or knock them into the bay as the wind rolls your over-sized umbrella all over the place. This has been our resourceful solution to the flyaway umbrella for the last few years. 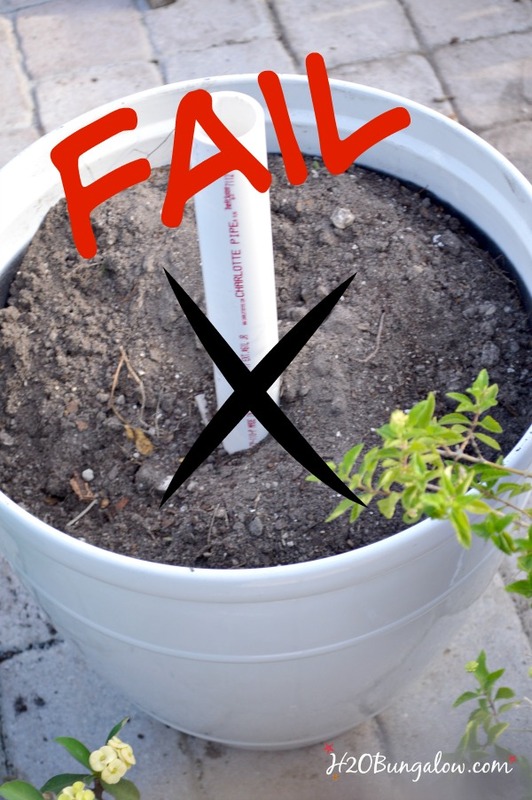 My DIY planter umbrella stand project fixes that. Home Depot sells two foot sections of precut pvc which was perfect for this project. I traced the diameter of my umbrella pole onto a piece of paper and brought it with me to pick out the right size of pvc. You’ll want a good fit, not so snug that it’s hard to put in and not so loose that the umbrella flops around. My first version was easy. I popped the pvc pipe in a planter with some shells at the bottom. By the next morning, it had fallen over and dirt was everywhere. What was I thinking? Duh! This version of my DIY umbrella stand planter is perfect and super strong. 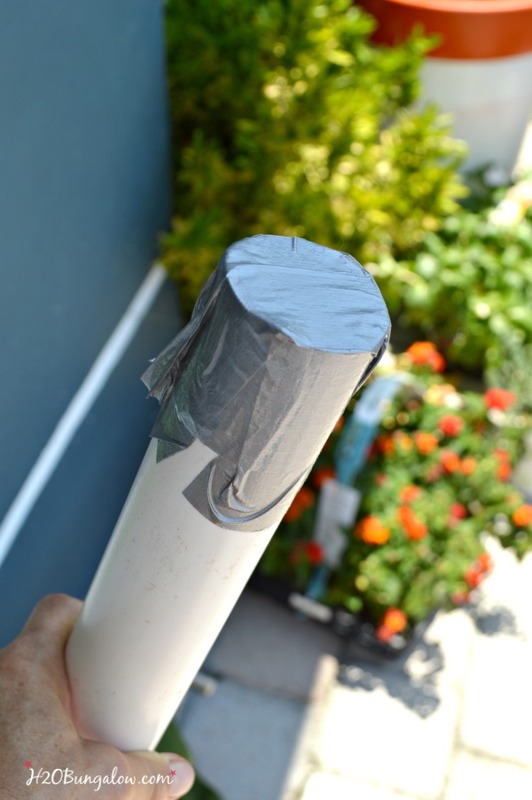 Start by taping the bottom of the pvc pipe with Duck Tape. 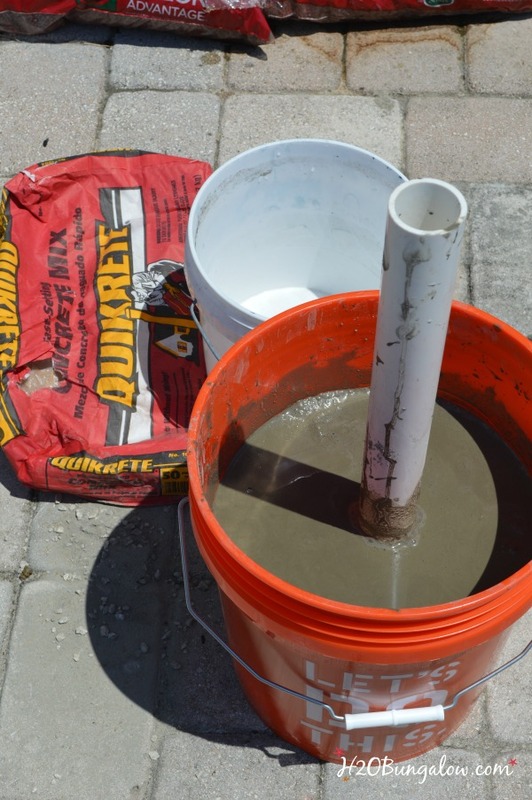 Hold it in the center of the 5 gallon bucket and pour in the Quickcrete. Dust billows up when you pour, so wear your eye protection and breathing mask for this step. One bag will use one gallon of water, it mixes right in the bucket. It sets in a few minutes. Let it cure overnight. Place the concrete bucket inside the big planter. Add something as filler and to help drain excess water. I used a few buckets of crushed shells. The umbrella stand was heavy at this point. I put it together in the spot I was planning to use it. Fill with dirt and plants. Once the plants grow a bit, the pvc pipe won’t show at all. I love the orange and whites. This version of my DIY planter umbrella stand is sturdy. We can get gusts of wind up to 45mph with a summer storm here. We needed an extra sturdy and strong umbrella stand. 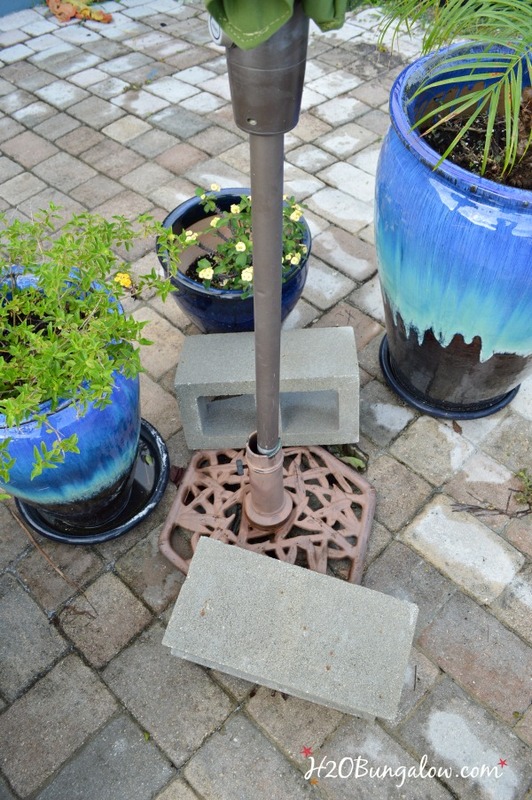 ~ I had to add this note~ A reader wrote in and shared her own DIY Planter Umbrella Stand she made after reading my post. She and her husband put a pvc end cap on the end of the pipe to keep out the rain. Smart! Thanks so much for the tip Kathy C! 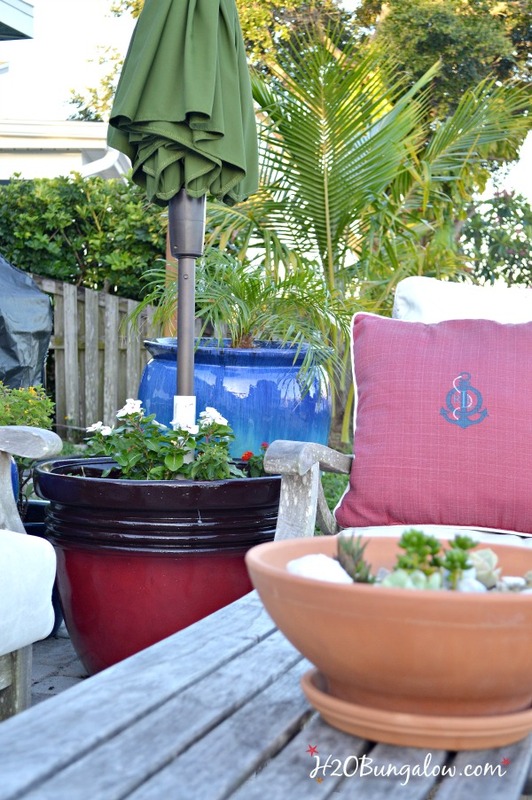 Now we can truly relax when sitting outside in the shade or when friends stop by. One more project done and several more to go! The backyard is finally beginning to shape up! I’ve noticed that when I look out the window, I’m starting to think about how much I like the way it’s looking instead of running through the humongous list of things I want to do! 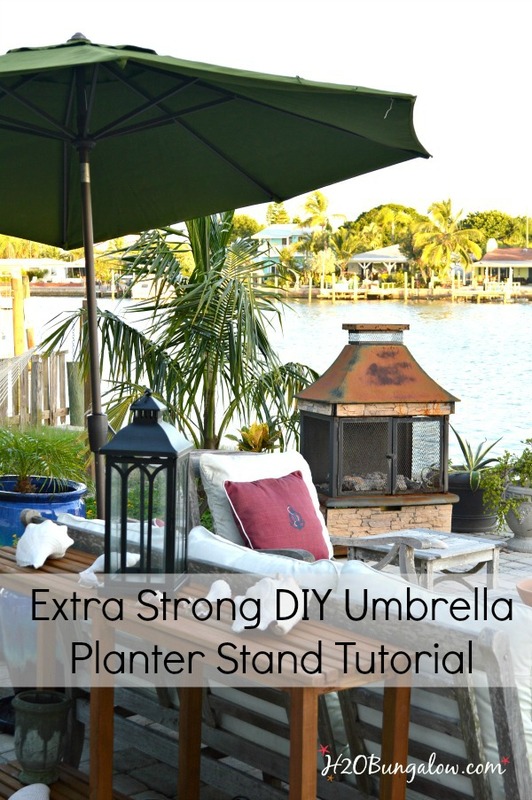 I can check my DIY planter umbrella stand off the list! 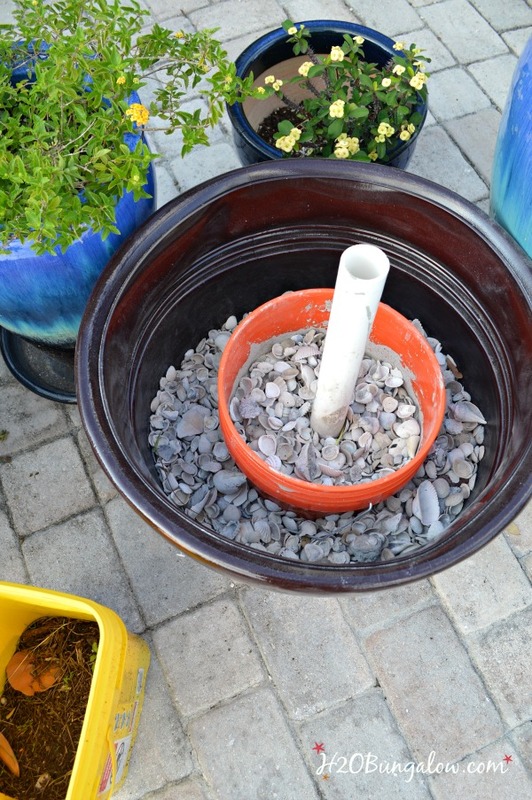 This DIY planter umbrella stand project took less than an hour. You can make it as big or small as needed. Our umbrella is huge, so we needed a huge planter. 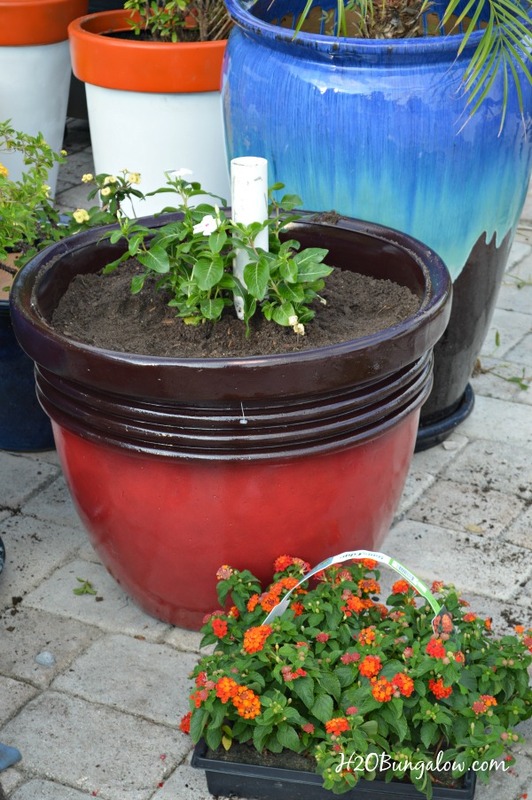 You can adjust the planter and bucket down for a smaller umbrella on a patio. 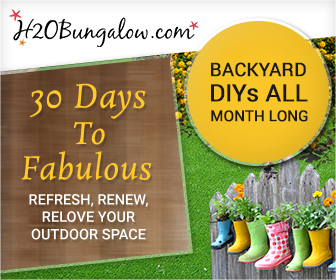 This is project #6, see my other 30 days To Fabulous Backyard Makeover Projects below! 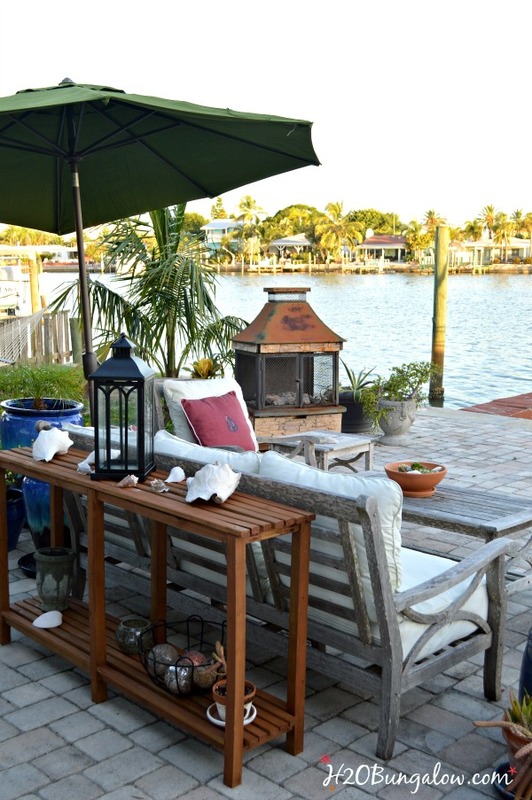 Start here to see what my backyard looked like before I started! I’m goig to put little caster wheels on the bottom of mine, so I can easily move is around my large patio as the sun shifts during the day. Thanks for your great DIY tutorial, inspired me! Hi Lindsay and thank you! I love your idea of putting castor wheels on the base to wheel it around. Your planter will be very heavy, look for wheels that are rated for 100-200lbs. You may know this already but just in case I thought I’d mention it. I know you’ll love this when your done and moving the umbrella stand around is genius! Thanks so much for your visit and note. Hi Wendi, I came across your post as I am doing a similar project – only it’s lumber on a concrete bucket inside large planter. May I ask how your plants did after a while? I’m concerned that the roots might soak in water in the section where there’s concrete. I’m hopeful they turned out fine as yours is the only post I’ve found so far. Hi Karina! The plants have done fine. I don’t know if I added drain holes to the outside of the planter in the post but I did. Our biggest challenge is the weather, the plants bake in the summer out back. I love that our umbrella doesn’t fall over anymore, it used to all the time. I’m sure your project will turn out great. Have fun! So much prettier than a typical umbrella stand! Thanks so much for sharing this at Welcome Home Wednesdays! Hi Crystal and thank you! It definitely looks better and works a whole lot better than a standard umbrella too! Thanks so much for your visit! Wonderful idea! 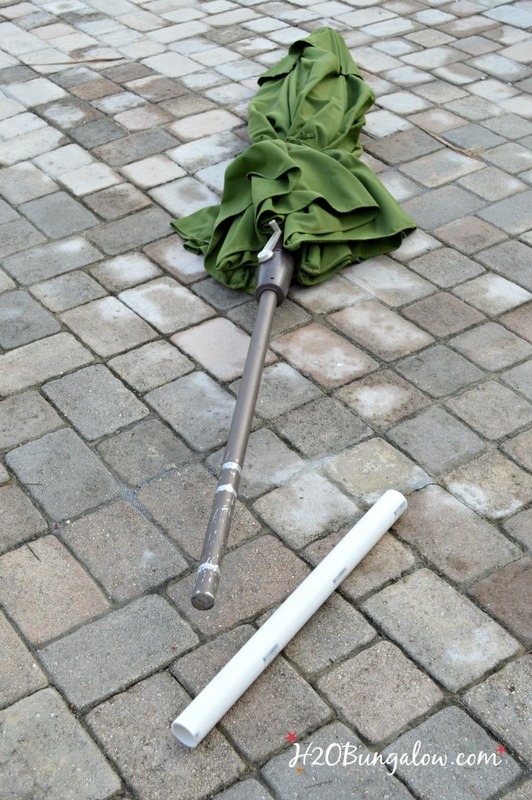 I have a typical patio table and the umbrella rests in the middle but, on strong, windy days, it spins around violently and threatens to get scooped right up into the air…I’m going to see if I could somehow incorporate your idea to tame our umbrella. Thanks! Hi Angie, That’s a great idea. From your description, I can perfectly picture your scenario! Another reader made one of these for her small patio table and loved it. Share a picture of your project on the H2OBungalow page and I’ll re-post it:) Thanks so much for your visit. Hi Christy and thank you! It was the perfect opportunity to make something big and pretty to cover up the 50 lbs of concrete! LOL Thanks so much for your visit! Brilliant, easy and looks SO good. Hi TPC and thank you! I can’t wait for it to fill out and look really pretty. My only challenge will be taking care of the plants so they don’t all wither and die on me! LOL Thanks so much for your visit & have a good weekend. I tried the bucket with soil and had the same problem, it just doesn’t work. 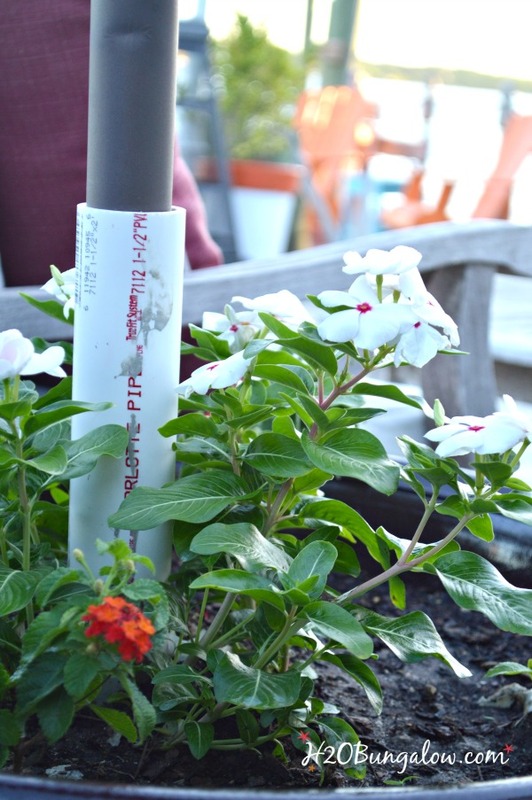 I never thought of using PVC pipe and concrete, (you are just so smart). I now have a large covered patio and don’t use a large umbrella any longer, but I have a beautiful little iron table with two chairs in my large flower bed and when I’m weeding I often take a little break at this table. I found a very colorful umbrella that fits it perfectly, but I don’t dare leave it out because of the wind and storms. your fix is perfect for this, it will fit right in with the flower bed. Thanks wendi. Hi Patty! LOL… birds of a feather 🙂 I thought the shells would hold the umbrella stable, but this one is huge and top-heavy. A garden cafe set with a pretty umbrella sunds divine. This is a perfect solution for a smaller table, plus you can make it right in a pretty pot and top off the pot with pretty pebbles or garden stones too. Please send a pic when you make one. As always, thanks so much for your visit and I love getting your comments! Thanks Gail! That would drive me batty. Gotta love Quickcrete, that stuff is easy to use for everything! I know you’d come up with a good solution to weigh down your planter and maybe repurpose something awesome in the meantime to go with it too! Thanks so much for your visit friend! Such a great idea! I will paint the pvc tube brown,so it blends in while the plants grow in. Hi Laurel! So glad you like my project. I love your idea of painting the pvc pipe brown, it will look much better than the white pipe sticking out. Good idea and thanks for sharing it! 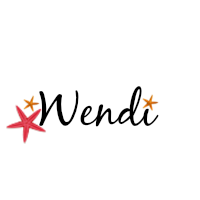 Have fun with your project!